the Results box or window, for the user to see the returned results. From the Add Content Menu, select Add Search Box. You will see all possible placements of the search box relative to the CSS design, Spaces, and other content already inserted. TIP! The majority of websites use a search box in the upper space or a side panel space. 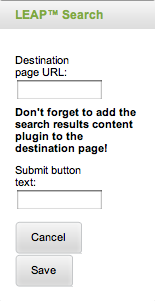 Submit button text - this give you the option to customize this to your site and branding for example "Find my ideal Dog!" or "Show me investments."